The Monk Martinian of Belozersk, in the world Michael, was born in the year 1370 in the village of Berezniko, not far from the Kirillov monastery. At age thirteen he left his parents and went secretly to the Monk Kirill of Belozersk (Comm. 9 June), about whom many had spoken of to him as being a great ascetic. The youthful Martinian began zealously to imitate his teacher, with whom he dwelt in complete obedience. At the monastery he studied reading and writing, and with the blessing of the monk Kirill, he became occupied with the copying of books. In time Martinian was ordained deacon and then priest-monk. After the death of the monk Kirill (+ 1427) blessed Martinian withdrew for silence to a deserted island, situated on Lake Vozha. Several monks gradually gathered around him. The monk Martinian established for them a church of the Transfiguration (Preobrazhenie) of the Lord and introduced a general ustav-rule for the inhabitants. Yielding to the persistent requests of the brethren of Ferapontov monastery, he consented to become hegumen of the monastery and brought it into a brighter condition. 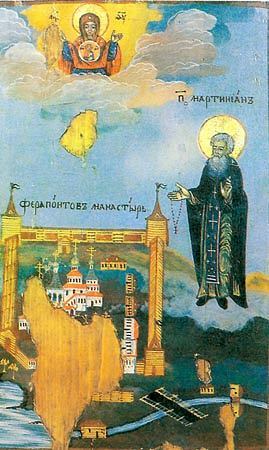 The monk Martinian rendered spiritual support to great prince Vasilii Vasil'evich in the difficulties of his time, when his first-cousin Dimitrii Shemyaka illicitly pretended to the Moscow throne. He was always an advocate of truth and justice. Afterwards, upon the entreaty of the great prince, the monk accepted upon himself the governing of the monastery of the Monk Sergei of Radonezh. In 1455 the monk Martinian again returned to the Ferapontov monastery. The last years of his life he was grievously ill and not able to walk, and the brethren carried him to church. The monk died at age 85. His relics were uncovered in the year 1514 – and the commemoration of the uncovering is celebrated on 7 October.